As you can see, I made pretty steady progress throughout the month, although I did have a day off here and there. There are still two days to go, so I may go on to exceed my goal. The novel I am editing will probably be 65-70k by the time I’m finishing, so I’m only about three-quarters of the way through the process. 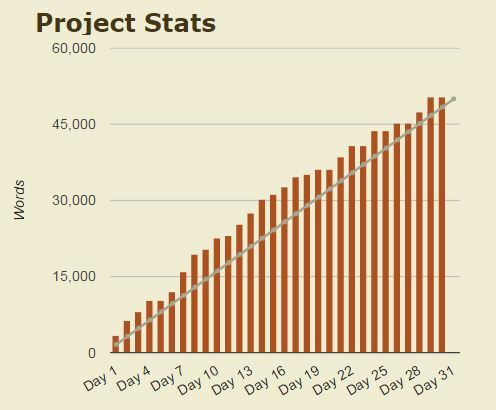 This was my first experience with NaNoWriMo, and it’s been a good one. I like the flexibility of Camp, and I like the way everyone is split into cabins. Although, having spoken to other writers, the cabin experience seems mixed. If you’re thinking of doing Camp, I would advise you to try and find a group of writers first, who are interested in joining your cabin, rather than joining a random cabin. Having said that, I already have a motivational critique group outside of Nano, and whilst Camp was a nice add-on, I’d probably have done the editing anyway. It just happened to come along at the right time. Would I do Camp NaNo again? Yes, providing I had a project in the right place. Given that the goals are so flexible, it’s something I could see myself doing more regularly. I don’t know about November NaNoWriMo – where everyone aims to write a 50k novel in a month – because it wouldn’t necessarily fit in with my personal writing timeline. We shall see. Anyway, well done to all my friends who beat their NaNo goals … and there’s still two days left if you haven’t! Woot woot! And Elise is leading the pack. She comes around for the final stretch. Oh! She’s leading by a neck. She’s picking up speed. Almost to the finish line. OH MY GOSH!!! ELISE JUST WON THE NANO 2016!! The crowd is going nuts. They’re throwing flowers and what looks like buttered crumpets. What a day folks! Yay! Party time! 😀 You did a lot more than me this month. You did really well too! I’m impressed at how much our cabin got done – a great effort all round!